Initiated in the Fall of 2002 and completed in 2003 as a joint collaboration between the UCLA/SPARC Digital/Mural Lab and the UCLA Visualization portal, the Virtual Great Wall of Los Angeles 3-D model brings the signature work of Professor Baca and SPARC into the virtual world of real-time 3-D visualization. UCLA/SPARC Digital/Mural Lab staff worked with the staff of the UCLA Visualization Portal to model in 3-D the entire Great Wall of Los Angeles mural site and the surrounding city area. To accomplish this enormous task, satellite photos of the site were used along with blueprints to model the entire flood control channel to scale. Photos of the Great Wall taken from the SPARC MREC Archive were scanned and stitched together to texture the virtual wall of the channel and photos of the surrounding area were used to texture the rest of the model. 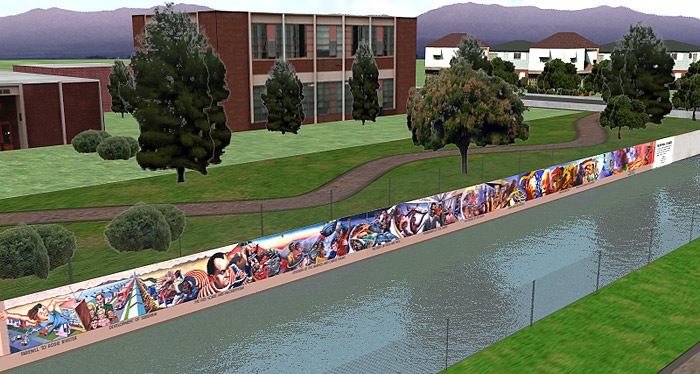 The completed 3-D real time model is displayed in the UCLA Visualization portal, which boasts a 160 degree IMAX style screen where viewers can navigate through the virtual Great Wall in real-time, literally flying through the site to view the mural from perspectives not possible at the actual mural site. The virtual model will also be used to pre-visualize how the next four decades of the Great Wall of Los Angeles (currently in early design phases as part of the extension and continuation of the mural) will look before they are actually in situ.